… he died of a heart attack while driving on a Florida highway. Born on July 12, 1939, he was 70-years-old when he passed away. A native of Astoria in Queens, NY, Kenneth J. Diono‘s family moved to suburban Hicksville, Long Island, in 1955. He spent seven summers on his grandfather's farm. Enlisting in the U.S. Navy in 1957, Dino spent several months stationed in Iceland. While there, he succumbed to friends' urging and entered a music talent competition. Singing an Elvis Presley tune, he placed second in the contest. He continued to sing while stationed in Maine, Florida, and Texas. Forming a band with five Mexican-American vocalists, Dino spent three years touring throughout Texas and Louisiana. A semi-regular performer at the San Antonio Blues Club, he often jammed with a young Doug Sahm. Back in New York, Dino signed with the Dot label. The association was short-lived, however. When the label found that Dino was not the "new" Pat Boone as it had hoped, it severed the contract. Switching to Columbia, Dino continued to struggle. An intended album was not released, while Dino turned down an invitation to form a duo with Paul Simon, who was using the name Jerry Landis. Although he recorded several demos for Elvis Presley, including "Good Luck Charm," Columbia was unsure whether to market him as an Elvis-like rocker or a Roy Orbison-esque balladeer and forced him to turn down an opportunity to record "Suspicious Minds." The song became a chart-topping hit for Terry Stafford 13 months later. 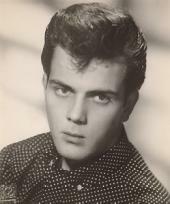 Dino's only hit was "Your Ma Said You Cried in Your Sleep Last Night", a #24 U.S. Pop hit in 1961. Robert Plant later covered this tune on his 1990 release, Manic Nirvana.